Published by Fr. Murphy on Wednesday, January 30, 2008 at 7:21 AM. There are some of you who might be under the impression that we here in the missions have forgotten what it feels like to be numb in one's extremities due to low temperatures, I can assure you this is not the case. I had a nice motorcycle ride to church this morning in 53ºF weather. This may be a record for us in Bánica during the Fr. Gee/Fr. Murphy era. I can only imagine that my poor mountain communities must have experienced the low 40s. Fortunately, Sr. Gracia along with the Diocese of San Juan had a winter coat project this fall. So, they should be warm and stylin'. Published by frgee on Friday, January 18, 2008 at 4:42 AM. i'm heading out for my anual retreat tomorrow, so please keep me in your prayers. i'll be back in two weeks. we've had problems in the past knocking down coconuts from this 50 foot tree in the back yard. we've climbed it, but it's current height and angle of growth have made it too dangerous. so, fr murphy and i tied a hatchet to a rope and threw the hatchet at the coconuts, but with a school in the landing area this became too dangerous as well. 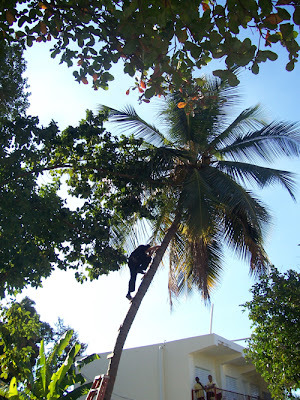 so, as we were examining these enormous coconuts yesterday we came up with the idea of setting up a 16 foot ladder and then building a ladder right onto the tree from that point. it's a little scary at the top, but more than sturdy enough to pick the 8 pounders safely. Published by frgee on Tuesday, January 08, 2008 at 7:48 AM. sometimes in life one needs to take matters into his own hands. so, when 4:30 rolled around and still no sign of the bishop, i told everyone that i was going to run the meeting. so, we all gathered and held the meeting. at 5:20, a mere 2 hours and 20 minutes late, the bishop arrived and i let him know that we were wrapping up the meeting. so, he only spent the next 45 minutes with them while i prepared the confirmandi and took care of setting things up for Mass. we actually started the Holy Sacrifice 20 minutes late, which isn't too bad. Published by frgee on Monday, January 07, 2008 at 3:20 PM. Published by frgee on at 2:28 PM. waiting on a bishop is worse that waiting for a dentist. i mean really, we've got 100 people just sitting around. the beauty of the thing is that people will remain calm for another 30 minutes or so at which time things will start getting a little testy here at the home base...i'll keep you posted. Published by frgee on at 11:58 AM. it's that time of year again folks: every house in the entire parish has been visited and 20 questions asked and answered. the data is all in and the bishop will be here this afternoon to begin his annual pastoral visit combined with the yearly confirmations. it entails lots of long meetings, so prayers would be greatly appreciated.